The Childhood Lead Prevention Program is dedicated to eliminating children's exposure to lead hazards. In San Francisco, children are most often exposed to lead when their hands or objects touch damaged paint, soil or surfaces with lead dust, and later their hands or those objects get placed in their mouth. 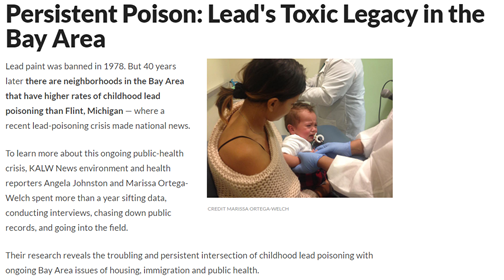 Lead is an invisible poison that can harm your child's growth and development. The Childhood Lead Prevention Program has been working since its launch in February 1993 to protect children from the harmful effects of lead exposure. 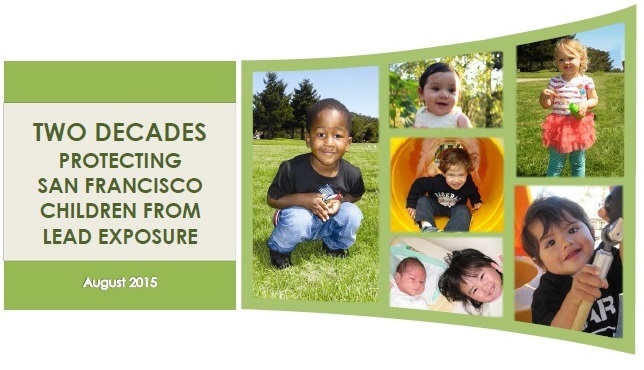 The program's report issued in August 2015, Two Decades Protecting San Francisco Children from Lead Exposure, provides the story of how the program has been effective in achieving their mission and what work remains to be done. Provide education and outreach on lead exposure prevention and lead health effects. Inspect locations where children live and spend time to enforce Health Code requirements for lead hazard prevention. Provide case management support to families of children with lead exposure. Collect and analyze all blood lead testing data in San Francisco. Publish the twice-yearly newsletter, Word on Lead Prevention, which highlights lead exposure prevention efforts. 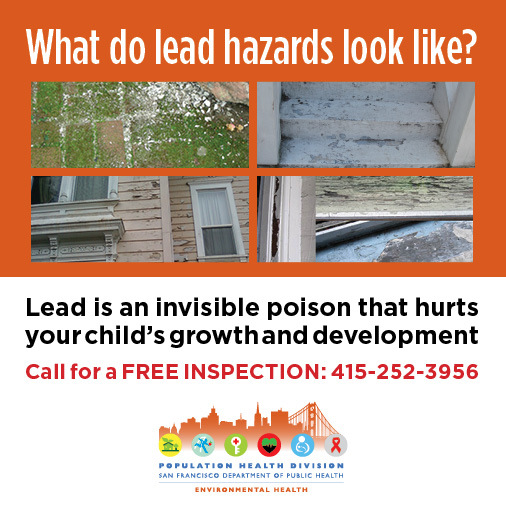 It is illegal for property owners to allow lead hazards to exist on their property. If you see badly damaged paint on the exterior or interior of a house, please contact the Department of Public Health-Childhood Lead Prevention Program by calling or clicking to enter a service request at 311. Property owners will be required to safely repair any hazards that have been identified. San Francisco law also requires that work on lead-based paint be done safely. If you see work on the interior or exterior of a building that allows dust and paint chips to spread outside of a work area because it is not properly contained or not properly cleaned up, report it to the Department of Building Inspection-Housing Inspection Services. Additionally, it is illegal for landlords to harass or evict tenants because they report suspected lead hazards. Contact the Rent Board if such hararssment or retaliation occurs. Department of Building Inspection (Housing Inspection Services): Enforces lead-safe work practices on pre-1979 structures. San Francisco Rent Board: Can provide information and support in cases of landlord-tenant disputes.